Hailey’s Shaun Speer (center) was one of five fishermen who fought and landed a record setting 262-pound yellowfin tuna July 29 off Baja California, Mexico. The yellowfin tuna fish was so big, a record setting 262 pounds, they needed a front-end loader to bring it 150 feet from the dock to the scales. "What a fish!" said Hailey's Shaun Speer, 60, co-owner/operator of C-U Next Storm Landscaping and one of a team of five anglers who spent a brutal three hours landing the fish Sunday, July 29. They barely beat the time limit of the 13th annual East Cape Offshore Bisbee's three-day fishing tournament. But the wait and the fight were worth it. They earned an impressive pre-tax payout of $37,095 in the $461,790 tourney. A total 61 boats took part in the Baja California tournament headquartered at Hotel Buena Vista in Los Barriles, Southern Baja California, Mexico. The winning team did the deed on a 30-foot cruiser named "Awesome" managed by Speer's wife, Theresa Comber, as part of the their Baja's Awesome Sportfishing and East Cape RV Resort businesses located on the Sea of Cortez. "It was the largest tuna I've ever seen," said Comber. She added, "It seemed against the odds when a humble 30-foot cruiser, pitted against the biggest names and some of the biggest, fastest and often most daunting boats in the world of tournament fishing, ends up winning anything—let alone an East Cape Bisbee Tournament with a record setting 262-pound tuna." Besides Speer, the Awesome's crew included captain Luis Duran Sandoval, 50, from Los Barriles; deckhand Adan Rojas Ruiz, 34, from Los Barrilles; Lucas Loynes, 30, from San Jose del Cabo, Baja; and team captain Mike Loynes, 61, from White Rock, B.C., Canada. Their catch shattered the previous tournament record. Comber said, "Earlier Lucas Loynes caught and released a striped marlin. Right after, Mike Loynes landed a hard-fighting, 40-pound dorado (also called Mahi Mahi) and brought it on the boat. "Because they were competing in the tournament's only Gamefish category, the question was, 'Do we run back, weigh the dorado and then go back out fishing? ', knowing the winning dorado weighed 39 pounds two days before.' The answer was NO, the game was still on. They iced down the dorado, plugged the gaff hole and hoped for another fish." Speer said about the subsequent fight with the big tuna, "We had a cabellero bait in the water for just five minutes and that fish took it and went down. We hooked up at 1:45 and didn't boat it until 4:15. It was a total team effort. We rotated through on the rod because it was too big to get to the boat otherwise. But I'm certainly glad we did." The sun was blazing hot and the fight was constant and strategic. The men spent 30 minutes with the rod on each shift and were doused with water when they finished. Meanwhile, the unseen fish was clearly big in size and not coming to the surface. Time became more and more of a commodity. The boat was two hours away from the weigh station. Scales closed at 7 p.m. Finally, they decided to intensity their efforts, taking five-minute spins on the reel to relentlessly tire the fish, Comber related. When it finally surfaced, the crew went wild. They caught the fish 35 miles south of contest headquarters and just north of Gordo Banks. But their work wasn't over just yet. Comber said, "Getting it onto the swim platform was a challenge; into the boat without a transom door, even more so. "With three guys lifting, the fish didn't budge from the platform. Luis was recruited from the bridge and four of them heaved it into the boat. The cow-sized tuna hit the deck and all hell broke loose with grown men acting like four-year-olds on Christmas morning." 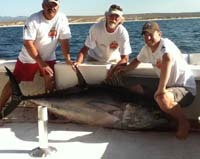 Captain Sandoval put the hammer down at 25 knots for 90 minutes and arrived one hour before scales closed. Earlier in the day, an angler named Armando Morales scored an early tuna victory by weighing a 111-pound yellowfin. It was dwarfed by Awesome's later tournament record. As it happened, Awesome anglers also held the East Cape Offshore mark in the tournament's other gamefish division—a monster 68-pound dorado landed in 2002, making them the top overall game fish boys for the Buena Vista meet.